Kansas topped $1 billion in forfeited federal funds early in 2016. But the clock kept ticking. Now losses have surpassed $2 billion, and the clock still ticks. Our failure as a state to adopt expanded Medicaid eligibility continues to cost us dearly, financially, and morally. Stop reading for a moment, and just watch the live ticker there from the Kansas Hospital Association. This is a running account of funding foregone. Watch as the dollar losses mount—at breakneck speed in just moments. More than $1,000 dollars a minute. More than $1 million a day. Starting January 1, 2014 Kansas could have allowed 150,000 more Kansans to become eligible for Medicaid health services. The federal government would have paid the whole tab for the first 3 years and then 90 percent thereafter. By now more than $2 billion would have flowed directly into the Kansas economy. Kansas only needed to say “yes.” Yet year after year Gov. Brownback and his legislative allies have made sure the answer was “no,” not for logical policy reasons, but because expansion was part of Obamacare. At first many Kansans were also skeptical. But their attitude toward the Medicaid portion of Obamacare shifted as a majority of states—including red states like Arkansas, Kentucky, and Iowa—moved to expand. By 2017 surveys showed a strong majority of Kansans favoring expansion. That sentiment played out legislatively last spring when a bipartisan majority of Kansas lawmakers voted to accept the federal funds, but Brownback quickly put his veto pen to the measure, and an override attempt fell just a few votes short in the Kansas House. As Brownback issued his veto, he likely thought Medicaid expansion was about to die anyway along with Obamacare. President Trump and a Republican Congress had put Obamacare repeal on the front burner nationally. Yet “Repeal and Replace” and the starker “Repeal and Replace Later” have failed time and again, in large part because of the blow that would be delivered to Medicaid. Medicaid expansion has proved to be an effective (and popular) way to reduce the number of Americans without health insurance. The Congressional Budget Office estimated that as many as 32 million Americans would lose health insurance as a result of repeal and replace legislation. Republican governors of expansion states opposed repeal. Kansas’ own Sen. Moran played a key role in keeping the possibility of Medicaid expansion alive for Kansas, after many of his constituents let him know how they felt. So now Medicaid expansion appears here to stay, and our years of refusal seem more financially inept than ever. Kansans who could have had health care have been left without or shunted to emergency rooms, a moral stain on the Brownback administration and on Kansas. 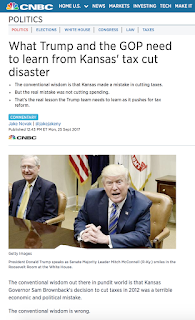 In June the Kansas Legislature took an important step toward fixing the Kansas budget by rescinding Brownback’s tax policies. Expanding Medicaid eligibility should be the next step toward freeing Kansas from the troubles of the Brownback years, and that vote should occur immediately when the Legislature reconvenes in January. —This entry was originally published recently in a variety of Kansas newspapers.